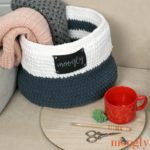 I knew I wanted to make a basket, and I knew I wanted to use Lion Brand Heartland Thick & Quick… and when I started crocheting, the Moroccan Basket just flew off my hook! Helpful Tutorials: Magic Circle; Dc2tog; Round 7 Tutorial; Moroccan Tile Stitch in the Round; Handles. Please see the Crochet Abbreviations Page if needed. Round 7 – 14: Ch 2, dc in each st around, join. (72 sts) After Round 14, break yarn and finish off. Turn this bowl Wrong Side out, so that the Right Side will face up when inserted in the Outer. Round 13 – 18: Repeat Rounds 11 – 12. Break Color B after Round 18. And that’s it! The liner adds a solid interior so the basket isn’t see through at all, as well as making it sit up pretty. And the handles are just the right side for carrying it wherever you need it to be! 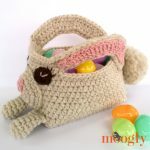 I hope you enjoy this free crochet basket pattern! Oh!!! I love this! I have no reason to make it … Quick! Give me a reason to make this!!! I need to have this. You could use it for a hat, put clips on the handles and use them to carry your grocery bags. lol Forgive me for my sick humor. But I would make it anyways, then later on if you forget someones birthday gift, tada, you will already have it made. You need something to carry your books back to the library in. 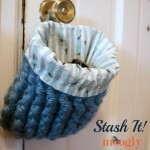 I’m going to make one of these for my bathroom to store my little crochet facial scrubbies, or small rolled up towels. 😀 Great idea Angela, thank you! Great idea, but my kitten would rather be on me than beside me! Be a great gift for anyone! This is a nice basket. I’m a new learner and wanted to make things like this. I would like to know if there is a video tutorial available. I would like to ask if the inner piece is done completely (until row 14) before we start with the outer piece? Or I shd crochet both from row 8 onwards? Looking forward to your reply. I’m doing the basket for a Christmas present. Hi Bee Bee! 😀 You make the inner piece all the way through Round 14, and finish it off, and set it aside. Rnds 8–14 are all the same as Rnd 7 – just dc evenly around. Then, you make the outer through Round 19. Then in Round 20, you insert the liner and crochet through both layers. Thank you. I am looking forward to getting this started. I’m sorry, that was unclear. You work between the dc2tog sts. Hi sorry I’m already confused about row 7. If I follow the instructions, I seem to make the row too long and bulky. I need a video for row 7,8,9. Or at least a picture for each row. Thank you! Thank you for your request. I am having the same problem..
Help, my outer basket came out much smaller than my liner. My stitch count for inner is correct and I think the outside is correct. Hi Kay! If it’s just too short, you can add a row or two (or three) to get to the same height! If it’s narrower around, then there’s another issue, as they should have the same stitch count. I had the same issue. I counted and re-counted. My stitch count is correct, but the circumference of my liner was larger than my inner. I used the same exact yarn and hook. I ended up “joining” two stiches of the liner to one of the outer in 4 places spaced throughout, when I connected the liner to the outer. There are a few “bulges” on the liner, that could probably be stretched out, but I’ve decided that, since I made it for myself, I’ll leave it. I plan to make another basket for my aunt, and I think I’m going to reduce the stitch count around the liner by 3. Can you do a tutorial of photos or a short video? I got to Round 8 of the outer portion and have no idea what I am supposed to do. I also read round 9 and this left me equally as confused! So now I am stuck and would really like to do this basket! Thank you!! The video tutorials linked above show all the stitches, I’m afraid I cannot make new ones for this pattern as I’m not currently working with this yarn company. I love your designs, and am always looking forward to what’s new! Definitely want to try this one. Thanks so much for sharing your talents. LOVE it! I’m really into baskets lately, and this is awesome, as always! I am quite new to crocheting, but I do love. If i TRY this….is it stiff enough to stand up well, or does it need stiffening? I made a little set of 3 baskets with lids as my first project as a Christmas gift, not knowing about stiffening at the time, and it was necessary for me to cut that plastic canvas stuff to line them. That did the trick, but….can you even stiffen something large like this? Hi Cynthia! 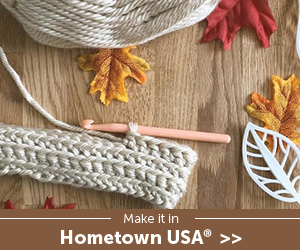 The liner on this one helps make it stiff – that and the small hook combined with chunky yarn. But of course it is yarn, and will fold and bend without *too* much effort. You could use plastic canvas around the body if you like! OOOH! Love this basket. Do you think it would work to double in size? Thanks for sharing with us! Wondering if you increased the size and how it worked out. Does this mean that I would dc2tog over two stitches chain one and go back into the same stitch for the first part of the stitch and in the next empty stitch to complete it? then use the next two empty stitches for the next dc2tog? Do you have a video or ? something so I can see where to put the stitches? Hi, thanks for the great idea. I’m really confused about Outer Row 7, if I follow the instruction as is, there seem to be too many stitches. And the row gets stretched, won’t hold up. Do you have either video or photo instruction for Row 7, 8 and 9? If I can see the photo of Row 7, I’d get much better idea. Thanks! In Row 7, there should be 24 ch-1 sps, with a dc2tog on each side of the ch-1. It won’t stand on it’s own – the liner and following rows help it. I don’t have a video for Row 7, but the video for Rows 8-9 are included in the video links in the pattern, after the yarn/hook/etc. I may do a video for Row 7 in the future. Tamara, Thank you very much. Actually V-shape part (Row 8, 9..) wasn’t bad at all. If there is a picture of Row 7, that’ll already help a great deal. I sort of get the idea, instead of empty V shape, you fill up that space with DC2tog. I’ll try again. The pattern is beautiful, I may try to apply in different things. Sounds like you’ve got the idea! 🙂 Yes, it’s just to make it a little more solid there at the bottom. Tamara, it worked! I unwound “regular” Moroccan stitches with empty V’s and re-started. It’s genius, as you said, the basket started to “stand up”! I was right at the first time, but your confirmation really helped, so on Row 7 you have tiny empty V and sort of two reverse V filled up, and Row 8 picks up the small V. This is far better than “regular” Moroccan stitches at the bottom. Thank you very much. Oh yay! 🙂 I’m so glad to hear it! I finished it with a few probs couldn t find the tut. at first. Still had some probs and thee are some mistakes. But I love it and think it turned out great!! !you very much for the pattern and your hard and talented work!! I posted pics of it. 😀 I’ll keep an eye out, thank you! 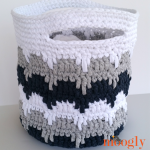 Hi Tamara- Is there a print friendly button for the Moroccan tile basket? I NEED HELP WITH THIS PATTERN. I’M LOST ON THE OUTER SHELL HOW CAN 72 STICHES GO DOWN TO 24 OR AM I READING THIS WRONG? It was nice to make this basket. A have to translate it in Dutch but with help of the tutorial i have complet it. Happy with the basket. Maybe i make another one too. 🙂 I’m so glad you enjoyed it Marjon! Completed the basket this week….proud of my new learning! Thank you for such a wonderful project pattern and I love the colour choice! The video links were quitter helpful as well. 🙂 I’m so glad to hear it! Thank you Traci! Love this pattern. I’ve just made 2 in super quick time and I can see me making more. In fact I use use a lot of your patterns as my favourite ‘go to’ for gifts. Always a pleasure to find a new Moogly design. Thanks Tamara, keep up the good work. The green print button does not work for me? And I must have this pattern. It is beautiful!!! Help! I’m having a hard time understanding round 7. Please explain what, “dc2tog in next 2 sts, ch1, dc2tog in same at as 2nd half of previous st and next st” mean. I’m just not getting it, and I’ve crocheted over 35yrs. Please help me…..
Hi Sonia! I’m sorry for the confusion – I’ll be making a video tutorial for this next, hopefully releasing it this week! I’m working on liner. When get to beginning of a round and chain two before making double crochets (rounds 3 +) get a hole. What would happen to pattern if I leave out the chain two’s and go directly from last round to double crochets of next round? 🙂 Glad you found it, thank you Carolyn! Just fished making the basket,, had to watch the video re: row 7, but overall a really easy project. I made this for my daughter’s birthday but am sorely tempted to keep it for myself☺ Guess I’ll have to make one for myself! 😀 Yay! Thank you so much Vicki! Dear Tamera: I cannot find the green print button. 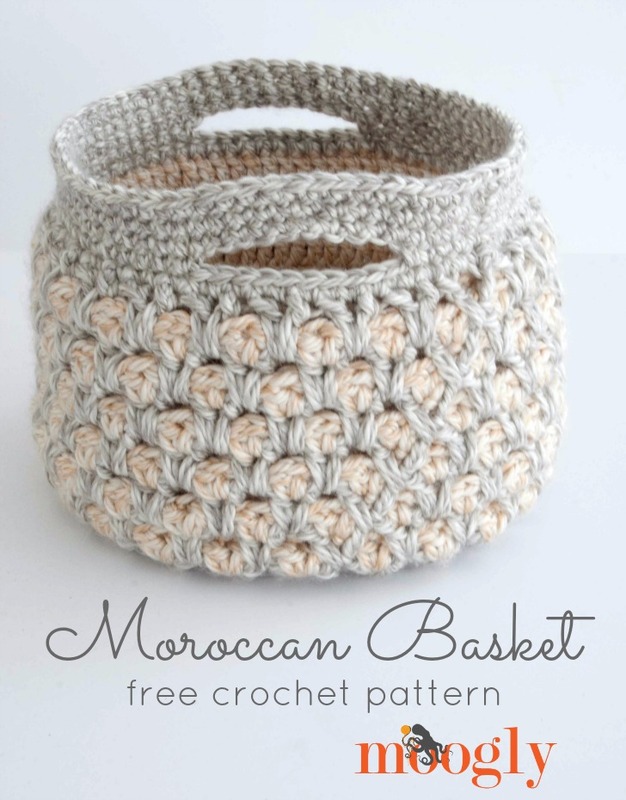 I want to make your Moroccan basket for personal use only. Please help! Thanks. Hi Gail! If you are on mobile, I’m afraid it won’t show up – this is a recently discovered problem and we’re still trying to find something that will work on mobile without breaking the site. So for now, I have to recommend that you go to PrintFriendly.com and enter the URL of the pattern there to create the printable copy. It’s one more step, but it works! I can’t get it to print for me. I made one basket and it is beautiful. However, the liner was a bit bigger than the outer basket. I am not very good with following instructions. For the liner, I’m wondering if the ch 2 at the beginning of each round substitutes for the first dc. I did ch2 AND a dc in first stitch. The ch 2 does not count as a st, so you don’t crochet into it, and do crochet into the first st.
What is the diameter measurement of the finished liner? Mine seems too large and I’ve used lots of yarn. I checked gauge before beginning. Thank you. It should be the same as the base of the outer portion, approximately 8″. Does this include the sides of the liner? This is a ‘must make’, there will allways be a place for it. thanks a million. I have problem with the pattern, i made 13 stitches, since you said that ch2 should not be counted a stitch, when i follow the pattern for round -1 , am getting correct 24 stitches in the next round. but my Round – 3 doesn’t have 36 stitches. Please help me with this. I really want to make this basket for my daughter. IF you cud share the video to make this magic circle it will be a great help to me. Hello Prashanthy! The video tutorial for the magic circle is linked above in the notes. When making Round 3, you alternate – 1 st in a st, then 2 sts in the next st, then 1 st in the next st, then 2 sts in the next st, etc. This means you will work 1 st in 12 sts, and 2 sts in 12 sts, so that you’ll have 36 sts at the end of Round 3. Does that help? I will try as per this. But please let me know how many stiches are there in Round -1 if we count ch2 together. Is it 13. If you were to count the ch2, it would make 13. But you never crochet into the ch 2, so it should not be counted as a stitch. Is this scalable? I’d like to make this in three sizes. Also I have none of that yarn in my stash and would like to substitute double strand of worsted. Would that work? Okay I get how to do round 7 and 8 of the basket but I cannot understand round 9 I’ve watched the Moroccan tile stitch video and still don’t get it is there anyway you could please make a tutorial of the actual round 7-9 of the outer basket part? Thanks Tamara, I love this pattern, and so many others of yours! I’m new to crocheting, and your patterns and tutorials make it so easy to get a great result. I’d like to post a pic but I’m not sure how to…. My inner liner is larger than the outer basket. I don’t understand why the liner isn’t made with fewer stitches. You can’t expect things made exactly the same to fit inside one another. The liner is too bunched up at the top. If you have no solution by now I will have to take the liner back to the bottom and redo it to fit better inside the outer basket. I do love the design, Thank You! Hi Dian! Mine and the others people have made lined up as written, with the liner pushing on the outer to create a stiff outer wall. It sounds like it didn’t work as well for you though. You can take out one increase round on the liner, but you’ll have to double up stitches a bit when connecting the two pieces. Thanks much for your quick response and help! I wonder if you just went down a hook size for the liner if that might help. That way your stitches will still iine up when joining, but the liner should be a bit smaller. Thank you so much for this pattern. It’s become a great hit as gift-givers. Is there a place to leave you a picture of my versions of your pattern? – and if you’ve already addressed this above, my apologies! So excited to make this, but having a little trouble getting started as I’m still pretty new to crocheting. For round 1 of the liner, do I make a magic circle, then ch 2 and then begin my dcs in the first stitch of the magic circle? The ch 2 leaves a gap, so I wasn’t sure. Thanks! When you pull the tail end of the magic circle closed, that gap should close up! 🙂 Just be sure you join to the first dc, not the ch 2. Oh, okay! I was chaining 2 and then joining into the next round which was leaving quite a gap. I”ll give it a try…thanks! can you show me how to do a ROUND 8-till the end of OUTER moroccan basket? I dont understand the pattern, im really confuse if i dont see the video…please can you help me Tamara Kelly??? Started and finished in two days. Super easy and strong. Thank you very much. It is beautiful. If you want to see a picture I would be more than happy to send one. Hi, thanks for sharing this pattern. It is lovely. I wonder if there would be any problems if I were to increase the size? make it taller that is. Any thoughts? Thank you! I don’t think there would be any issues other than it might not want to stand up as well on it’s own – keeping it filled with items should help that though! I MADE 3, ONE FOR MYSELF, ONE FOR MY HUBBY TO USE IN HIS MUSIC ROOM AND ONE FOR MY SON. 🙂 Wow, I’m so glad you like the pattern Angie! Thank you! Gosh, could’ve sworn I sent you an email via a Reply here or on the Contact page……but want to send you a picture of MY finished basket, of course, using your design, but don’t see a way to upload a pic. Can you help with this point? Also, my only issue with MY basket is that it doesn’t stand as straight and firm as yours. I used similar yarn and followed precisely the pattern. Did you do something to get yours to look so firm????? Please advise. Would like to give as present, but not real happy with how floppy it looks. Hi Jo! I don’t have a way to host pictures in the comments, but you are welcome to email me at [email protected] or share them on social media – on the Moogly Facebook page, or on your own sites, and tag me! 🙂 I’d love to see it! I’m sorry it’s floppy! I think the gauge is the key – tight stitches for a firmer fabric. Hi Diane! I’m not sure either, without being able to see what you’ve made so far. 🙁 I’m not sure how else to present that line of instruction. Hey Diane. I was late to the party on this one as well. BUT — I finally got mine done and it’s really very nice, BUT it is floppy like yours is going to turn out…..sorry, but it will. Tamara wrote back to me at some point and said it really has to do with the tightness of your stitches, but I already crochet pretty tight, so don’t know how much tighter I could have gotten it, with the yarn I was using (which was basically what the pattern called for).. However, evidently others got the pattern to work just fine….so good luck – keep working on it and even if it’s floppy – it’s lovely with other balls of yarn sitting around. For some reason I never sent Tamara a picture of my finished work, but maybe I’ll get around to that soon. Comment 51 of this blog might be helpful to you. Also try to understand the drawing. This is a confusing row until it finally clicks in your head. Good Luck! I’ve wanted to make a basket to see if I liked making them. I looked for a pattern and found this one. I love it! I’m not one to work off a computer. I’m of the “old school” and like the paper in my hand. I entered my email address so I could print it out and tried several times but couldn’t get it to print. Unfortunately I will have to find another pattern somewhere. You can also copy and paste into a word document. Directions are very confusing! I actually watched the video many time to rewrite the instructions. Then went to the remainder of the project and now find myself lost again. Have you ever thought about rewriting your directions in a different way to split the 2 portions up with more pictures of each step? But better yet add an ‘entire video’ of you making the entire basket. Some of us are visual and are not completely understanding your description of the directions. 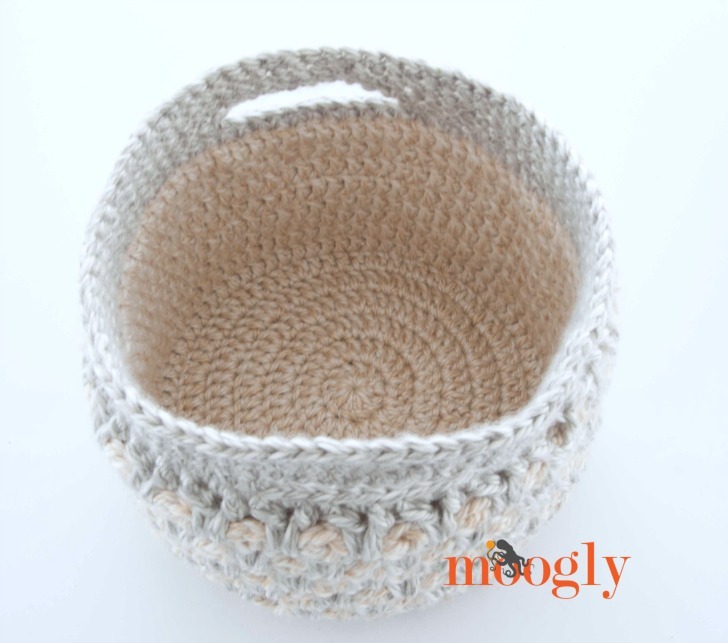 HELP… I as I read thru the other comments, I too would love to make this beautiful basket. Once concurred would love to make many more! I’m sorry Patti, but there are a number of reasons I won’t be able to do that. sorry to hear that, since that was the outcome I moved on to another basket design and have now enjoyed making many! Reading through even more comments it certainly looks like I was not alone in my difficulty with this basket project. Maybe someone else out there could capture this project in a complete video tutorial and we could try it again. I’m at row 8 of the outer section. Now I realize I have much more than 72 ch 1 spaces from fow 7. The instructions say I should have 24. How is this possible with ch 1 after every repeat? I’m about ready to give up! Help please!! Hi Bente! Did you watch the tutorial video linked above? I love this basket, very simple to complete. I have made 3, 1 for me, 1 for the hubby and one for my son. I would love to post photos be I am not sure if I can. Hi Angie! I’m so glad to hear it! Unfortunately I can’t host photos in the blog comments, but if you post it on Ravelry or social media I’d love to see it! I made 25 of these, but smaller, so they’d be like candy dishes. I gave a bunch out as Christmas baskets with little Christmas candies in them (like Christmas Hershey’s kisses). You can see them all on my Ravelry page here: https://www.ravelry.com/projects/RitaMiller/moroccan-basket along with how I made them smaller. This is my all-time favorite basket pattern. Thanks for the pattern, Tamara! This is a lovely basket. I am making this basket, I am on step 8 of the basket and I don’t understand the pattern. It’s becoming very difficult after round 7(but you explained round 7) and there is no video after that round. Can you please explain how to work from round 8. I really love this pattern and I wish to complete it. Hi I used your patrern and I would like to share some pics. I done it using cotton cord and added one more row 🙂 thanks for sharing. love your moroccan basket so much but being a beginner, i’m very lost. Really hope you will make a video from beginning to end including the inner piece. Do let me know when this video is out. Appreciate it very much and so looking forward to it. Hi Mylene! I won’t be able to make a video for this pattern, but there are tutorials for all the stitches used linked above! How would you increase the diameter of the basket? Is it just added a round and the basket weave will just come out correctly?